This integrated geography programme combines physical and human geography, and offers opportunities for specialisation and a year spent studying abroad. Those choosing the BSc will usually have studied some science at A level or equivalent, but it is possible to transfer to the BA if your interests develop differently. A total of 18 points in three higher level subjects including grade 6 in Geography, with no score below 5. A total of 16 points in three higher level subjects including grade 6 in Geography, with no score below 5. Pass in Access to HE Diploma, with a minimum of 23 credits awarded with Distinction in the Level 3 units, the remainder of the Level 3 units awarded with Merit. D3,D3,D3 in three Cambridge Pre-U Principal Subjects, including Geography grade D3. AAA at Advanced Highers (or AA at Advanced Higher and AAA at Higher), including Geography grade A at Advanced Higher. Successful completion of the WBQ Advanced Skills Challenge Certificate plus 2 GCE A-Levels at grades AAA, including Geography. You will gain a broad range of practical and project management skills, making you attractive to both the public and private sectors in the UK and around the world. We offer an exceptionally wide range of optional modules and have a particularly low staff-student ratio (Guardian University Guide 2018), encouraging individual choice and personal supervision. We are proud of our research record which has been consistently high. You will therefore be working with thinkers at the cutting edge of developments in their fields. Spend your third year abroad at an approved university, such as the University of Toronto, Université Paris-Diderot, University of British Colombia, UCLA, or Universitat de Barcelona. The Geography BA and BSc share core elements and it is your personal interests, and the options you wish to pursue, that should shape your choice. In your first year you take two core modules and four optional modules, one of which can be outside the department. In year two, one compulsory module is supplemented by 3.5 credits of optional modules, including field research-based courses, chosen from a substantial pool. At this point it is possible to begin focusing on topics such as environmental and conservation management, remote sensing, geomorphology and climate change. You will spend your third year abroad at an approved university. Your dissertation is the main focus of year four, and you will also take further options. Fieldwork throughout the programme can take place both in the UK and abroad, and it is possible to base your dissertation on an overseas project. Recent destinations include Australia, Belize, India, Montserrat and Papua New Guinea. Financial support for overseas fieldwork expeditions may be available through expedition funds. You may take one 0.5 credit module taught outside of Geography if you wish. You then select 3.5 credits of intermediary modules from the specialised areas below. To qualify for the BSc, 2.5 of these credits must be in Physical Geography. You may also substitute an ancillary module from outside the department, allowing you (as in your first year) to continue developing particular language skills or start to become more specialised. Year three is spent abroad on either a UCL or Erasmus exchange. You will take 2.5 credits of advanced modules from the below. You may also attend a field class (0.5 credits), study abroad for a term (1.5 credits), or enrol on the independent study module involving close collaboration with one academic (0.5 credits). Human Geography: Geographies of Infrastructure; Urban Political Ecology; Global Urbanism; Geopolitical Events; Geography, Culture and Materiality; Postcolonial Geographies of African Development; Mining Social and Geographical Datasets; Gendered Geographies; Advanced Environment and Society. Physical Geography: Coastal Geohazards; Global Environmental Change; Principles and Practices of Remote Sensing; Managing Freshwaters in the 21st Century; Palaeoclimatology. Water and Development is an option that spans human and physical geography. You can also take Professional Geography or take a module outside the department. Your timetable will include lectures, seminars, tutorials, practical classes and fieldwork. As you progress, the focus shifts to independent and critical learning, with student-led discussions and presentations becoming more important. First year assessment combines independent coursework completed throughout the year, with end-of-year written examinations. In years two and three, assessment may vary - some modules combine written examinations with independent projects, some assessed solely by written examination. Your dissertation carries significant weight in your final year. 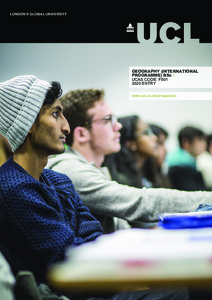 Detailed course descriptions are available on the department website: Geography (International Programme) BSc. Having developed skills associated with both the sciences and the humanities, UCL geographers are particularly adept at taking different perspectives on an issue or problem. These skills make our graduates attractive to employers. UCL geographers have a particularly good track record of securing employment after graduation (Guardian University Guide 2018). This may be partly because of the significant project management skills they develop by undertaking their supported dissertation research. Our geographers embark on many careers: from teaching and research to commerce, planning and administration. Their expertise is valuable for environmental and physical planning, surveying, government, industry and the financial sector. In the selection process we aim for there to be two-way communication so both you and the department can make the right choices. In addition to looking at your qualifications we will also be examining your personal statement for evidence of your interest in and enthusiasm for geography and for proficiency in key skills. Most students are invited to attend an open day once they have been made an offer based on their predicted or actual A level (or equivalent) performance and their potential and aspirations. Our open days include student-led seminars, a short tour of UCL, a chance to talk with representatives of all our different research groups, and introductory masterclasses run by key members of staff. We are happy to consider applications for deferred entry, especially where interesting and productive plans are being made for the 'gap' year. The Geography (International) BA and BSc degrees follow similar paths. Although it makes no difference to the module choices open to you, most applicants base their degree choice on the A level (or equivalent) subjects they have followed: BA if they have taken arts or social science, BSc for those with sciences. It is possible to transfer if your interest develops in a different direction.